The Russian Front, winter 1943. A battalion of the Spanish Blue Division runs into several horses’ heads scattered over the frozen surface of a lake. The bodies are submerged under the ice. Beside one of the horses lies the corpse of a Spanish soldier. His throat is slit and carved into his shoulder with a knife are the words, "See that God sees you". His superiors order soldier Arturo Andrade, (Juan Diego Botto), a former police inspector, to investigate the matter. He takes on the task with professional rigor, aided by Sargeant Estrada (Carmelo Gómez). They soon discover that what is behind the murder is a perverse vengeance for insults made in the past and it looks one dead body is only the beginning. No one is free of suspicion and no one is safe. In the midst of the cruel war, the hunt for the murderer is on, a search where we won’t know who is the hunter and who is the prey until the very end. One of those titles that Metrodome seem to pick up that have not been widely seen outside of their home country (which in this case is Spain), Frozen Silence (Silencio en la nieve), which is also known in the USA as Silence in the Snow, has not seen much coverage in the English speaking press, but Variety called it "An ambitious, multilayered thriller" and "helmer Gerardo Herrero's best film since 2003's The Galindez File." The film stars Juan Diego Botto (Zorro), Carmelo Gómez (Tierra, Night of the Sunflowers), Víctor Clavijo (Before the Fall) and Francesc Orella (Julia's Eyes). 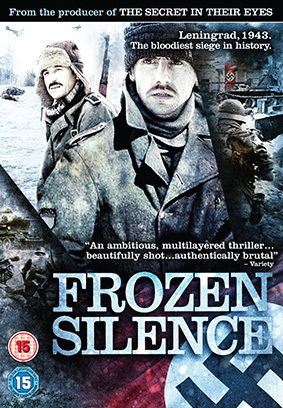 Frozen Silence will be released on UK DVD on 13th may 2013 by Metrodome Distribution at the RRP of £15.99. Perhaps unsurprisingly, no extra features have been announced.